Product prices and availability are accurate as of 2019-04-14 21:08:00 EDT and are subject to change. Any price and availability information displayed on http://www.amazon.com/ at the time of purchase will apply to the purchase of this product. 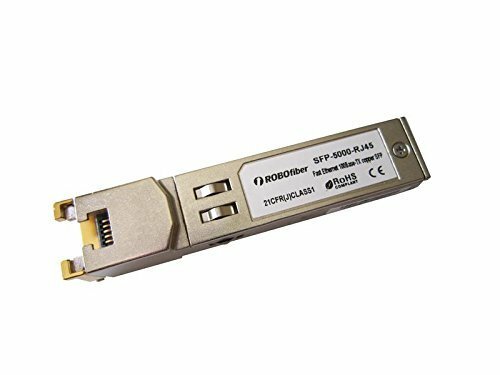 The SFP-5000-RJ45 module is a copper SFP supporting 10/100Base-TX copper Ethernet standards. Module is compatible with most Fast Ethernet SFP ports available on various networking devices. The fixed 100Base-TX speed model is highly compatible with the vast majority of networking devices running Fast Ethernet speed ports. Such ports are encountered in specific applications like Industrial Networks, Power and Utilities data networks or SCADA applications. The 100Base-TX fixed rate SFPs are compatible with IEC 61850 GOOSE, making them the perfect choice for electrical substation automation applications. SFP's or miniGBIC modules are extremely versatile, working with any active equipment that support the SFP type of interface: Ethernet switches, routers and any other networking equipment. Our SFPs have been tested and found 100% compatible with various Ethernet switches from major manufacturers like: Cisco, Nortel, Extreme, ZyXEL, D-Link or Netgear.